When we started the process of TSW, we had an appointment with one of ''the best dermatologists in Miami", I remember when she saw my daughter, she made me feel like the worst mother ever. She said I was reckless to leave her eczema flare up that way and wanted to admit her in the hospital right away to prevent any serious infection. She also did a skin biopsy. She barely let me talk and didn't care about my opinion. After the appointment, I cried a lot because I didn't know if I made the right decision when I refused to admit my daughter in the hospital. Fortunately, days later, I received a phone call from her office saying that the results of the skin biopsy were negative; so, I felt calm again. After this experience, we didn't want to go to any doctor anymore. 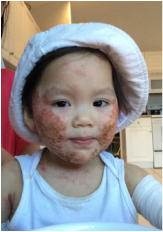 However, last August, we suspected that Catherine was infected: she was extremely itchy, the red patches in her face were spreading fast and the oozing was dark yellow and crusty. So, I googled 'Doctor with Natural Approach Miami Kids' and Dr. Bruce Eisenberg came up at the top of the results. We liked his profile since he has integrated Homeopathy into his Pediatric medical practice. In our first appointment, he didn't panic or made us feel like bad parents. He saw our daughter and asked us all about her since she was born. We emphasized that we didn't want to use any kind of steroids and he respected our decision. He prescribed Mupiricin 2-3 times per day, Coconut Oil, and Probiotic once a day. A week after, she showed signs of improvement. In the next session, Dr. Eisenberg recommended us to do the IgG and IgE test. In simple words the IgG test identifies food that produces a delayed physical reaction; while the IgE test is related to immediate allergy reactions. Both are blood type tests and the results vary per patient. In the case of our daughter, we had to eliminate rice, apples, watermelon, lentils and many other foods that appeared in both test results for at least 90 days. Then, little by little we would have to reintroduce them again. We are still on the process, but I have to admit that since Catherine followed this food regime, her eczema improved big time. To conclude, I do recommend that you search for a supportive doctor during TSW because infections are very likely to happen. Definitely, we were lucky to find Dr. Eisenberg, who is not a TSW supporter, but he is open minded, respects parent's opinions and provides alternatives to help you find the root cause of eczema.